As most of my readers know, I am a huge fan of the World GenWeb Project. 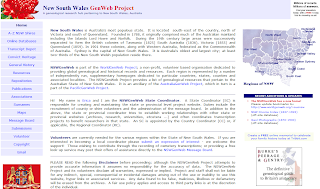 I came across the New South Wales Genweb Project and thought that I would share it with you. For those that are not aware, New South Wales is located in Australia and it is the most populated state. This GenWeb site offers a great deal of information for those researching in this area. The following is just a small example of what is available for research. As with all GenWeb sites, they are generally maintained by individuals donating their time and talents to assist others in their personal family history quest. Click New South Wales GenWeb Project, if you would like to research further. Have fun!